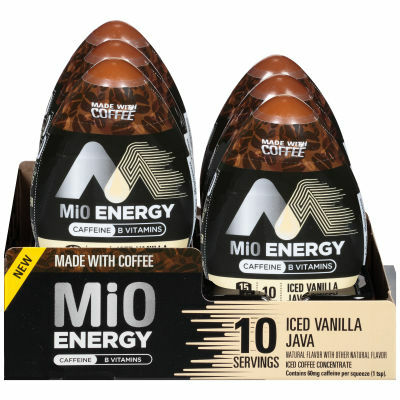 MiO Energy Iced Mocha Lava Iced Coffee ConcentrateTime to be a magician, hold the compact MiO bottle in your hand and create a historical yet reinvigorate tempting iced coffee with the all time favorite iced coffee concentrate in Iced Vanilla Java flavor. Squeeze the enticing iced coffee in water to rejoice your mornings and refresh your days.Entice Vanilla SweetnessMiO always go a long way, makes 10 servings with 15 calories per 1/10 bottle. Simply click the bottle twice to lock the freshness and alluring Iced Vanilla Java aroma, fragrance the fresh moist air. Savor your mornings with Maxwell French Vanilla iced coffee that is easy to make and have a tempting taste makes you refresh but energizing. Serving size 1/10 bottle (5 mL/1 tsp).